Mass at a Philippine Army base | Walk with us! This morning I was picked up just before 08:00 and driven to a nearby Philippine army base as I was scheduled to celebrate the 08:30 Mass. The base has a regular full-time chaplain, but he is on vacation and Fr. Arthur Guevarra, SCJ, is filling in for him. He asked me a few days ago if I wanted to take one of the two Masses and gave me the choice of 06:30 or 08:30 and opted for the later. I was accompanied by Deacon Christopher Alburo, SCJ, who was one of the six deacons ordained in Dumalinao on May 13th. The church was full as it is a pretty good size army base. Our Eucharistic ministers were retired army personnel. One told me he was in for 29 years and all together about 34 years of government service. I asked about how army pensions worked in the Philippines and he said it depended on years of overall government service. He had both military service time and five years as a teacher. I didn’t have a chance to ask the others but I was told they too were retired military. They do not live on base but nearby. Since I do not speak the local language the Mass was in English but several of the hymns were in Binisaya. As I have experienced throughout my visit, the congregation sings well, certainly much better then most US parishes where I’ve celebrated Mass. Today we were accompanied by a piano and a small choir of three young men and three young women. The offertory was s bit different from some of the other parishes I’ve been in as only a small representative group came up with their envelopes rather then all the kids and some adults as I’ve seen elsewhere. However, the desire for a blessing at the end of Mass (especially by the children) was just as much a part of this Mass as any other. The person takes the priest’s hand and touches his/her forehead with it for the blessing. I should say something about church architecture that is very different from any in the States. It all has to do with climate. Every church that I have been in on the island of Mindanao has open walls. Where we would have windows these churches are open to the outside air. They are covered with grill work to keep the church safe when not in use, but still allow as much air to flow in and around the church as is possible. Vestments too are a bit different, at least those worn by most priests. The chasuble serves as both the alb and chasuble and is made out of a light material. At important celebrations the main celebrants have on a traditional alb and chasuble but most of the time it is the lighter garments. Finally, everywhere I’ve been the Masses are well attended and by young and old as well. 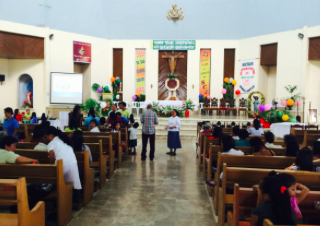 It may be a bit different in Manila or perhaps some other large cities but here on Mindanao the faithful do fill the church for Sundays and important feasts.